Patent-pending design puts squirrels in their place—on the ground! High tensile, spring action base gives no perch for squirrels—they slide down the tube and just keep going! 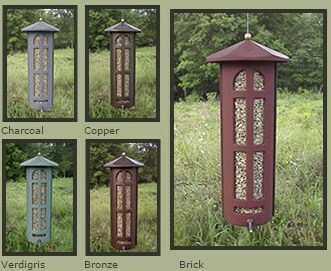 Calibrated for feeder birds as large as cardinals, the Stopper accommodates most seed mixes. Seed saver ports prevent spillage, no matter how many times the base is tripped. Ventilated, impact-modified seed tube holds 14 cups of seed. Sturdy, stylish and eminently functional. Made of durable cast aluminum, the Townhouse Feeder will attract songbirds such as titmice, finches, siskins, chickadees and nuthatches. Even the occasional woodpecker may stop by. The powder coated finishes will not fade or discolor. The aluminum perch slides through the bottom, below the seed ports. The rubber washers hold it firmly in place. 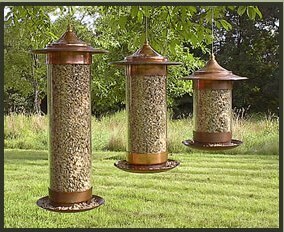 The feeder should be taken down occasionally for a thorough hose cleaning. 14” tall x 5” wide. The solid copper parts are soldered for a lifetime of service. The impact-resistant acrylic seed tube allows easy monitoring of seed levels. An occasional hose cleaning keeps your feeder looking and working great. 10” , 14” and 18” tall x 7” wide. Antique or Bright finish.